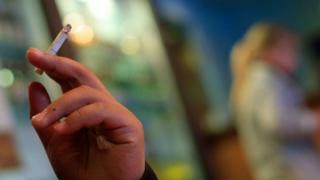 Plans for a total ban on smoking in Austria's bars and restaurants has been scrapped, according to the far-right Freedom Party. The ban, a policy of the outgoing government, was due to come into effect in May 2018. Scrapping the plans was agreed by the Freedom Party and the conservative People's Party, which expect to form the next coalition government. But the age at which a person can buy cigarettes will still be raised to 18. There will also be a ban on smoking in cars where under-18s are present. "I am proud of this excellent solution in the interests of non-smokers, smokers and restaurant owners," Freedom Party leader Heinz-Christian Strache said. Current policy allows smoking in restaurants and bars, but only in specially designated areas. Outgoing Health Minister Pamela Rendi-Wagner, a Social Democrat, condemned the new policy. "Overturning the total ban on smoking in the restaurant industry is an enormous step backwards on health policy," she said. An election in Austria on 15 October failed to yield a conclusive result. But the head of the Peoples Party, Sebastian Kurz, 31, is poised to become Europe's youngest leader, should negotiations to form a government with the Freedom Party succeed. Kurz and charisma: What propels young leaders to power? The parties previously governed the central European country together between 2000 and 2005. Mr Strache's party campaigned on issues relating to immigration in the run-up to October's election, but smoking policy was not a prominent. Many countries in Europe have brought in smoking restrictions in the last decade. According to the European Union, 17 member states have comprehensive smoking bans in place. The UK banned smoking in all enclosed workplaces, including restaurants and bars, in 2007.